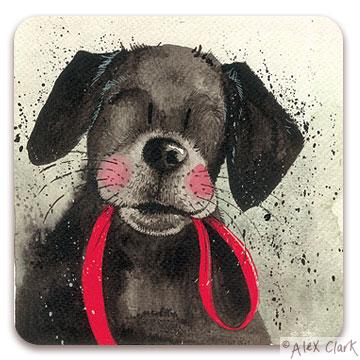 An adorable coaster from Alex Clark called "Red Lead" featuring a charismatic black labrador who is ready to go for a walk with his lead in his mouth! Painted using pastel colours in Alex Clark's distinctive style. The cork backed coaster has a wipe clean surface to keep it in immaculate condition. An ideal gift for any dog lover!